PDQ Cold Call offers an industry-leading service for the temperature-controlled transport of goods for the food supply industries, providing a consistent quality service for the transport of food samples, palletised items and promotional materials. We have experience working with some of the nation’s largest food and drink suppliers, leaving us ideally placed to service supermarket regional distribution centres. Since our first day in business, we’ve set a standard as temperature-controlled couriers with a rapid and highly reliable transport process, providing our clients the very best in terms of utilising the most innovative technology, training and insight. This is evident in our work with some of the biggest names in the industry, providing courier services for companies including Tesco, Sainsbury’s and Starbucks. Here at PDQ Cold Call, our entire fleet of vehicles come complete with top-of-the-range temperature and location-tracking systems, giving each client updates on the exact point of your consignment’s journey through the RDC supply chain. As well as to-the-minute location updates, you’ll also be able to monitor its exact temperature, with the added flexibility of being able to transport different goods at different specific temperatures in one transport with our service. With almost 20 years’ experience as a food courier service, we have a deep appreciation of how much peace of mind comes from using a service that prizes transparency and reliability. To ensure this transparency is in full effect, we provide a detailed electronic audit trail at all phases of your delivery’s journey. This guarantees that there will be no point at which your transport is unmonitored or unaccounted for, just continual real-time updates on where your consignment is and the exact temperature it is being maintained to. In addition to this, there are a range of safety features in effect with our vehicles, to further ensure the total reliability of each transport. 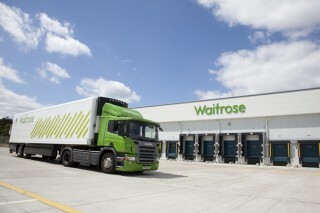 To ensure the most reliable food logistics in the UK, we not only have the best equipment in effect, but each of our drivers is also fully trained to offer the very best at each point of the supermarket supply chain. To make sure we guarantee this safe chain of custody at all stages, we employ innovative barcode technology, uniquely identifying every single item we transport, with our "Track and Trace" portal letting our clients view their delivery online to track the temperature and location of goods in real-time. Our industry-leading courier options have led a number of leading food retailers to use our transports for their supermarket supply chain on an ongoing basis. We have a detailed knowledge of all industry guidelines and implement all regulations seriously, possessing full UKAS ISO 9001:2008 accreditation as a quality food courier service. We ensure that our service continues to offer unrivalled excellence and consistent integrity across vehicles, drivers and customer service. All of our staff, from those in our office to those out on the road, ensure the best temperature-controlled courier service for your RDC supply chain. For more details on our courier options, contact us here at PDQ Cold Call. If you have any questions about our food courier service for supermarket RDCs, or are ready to book a temperature-controlled transport, please get in touch today. Our friendly and knowledgeable staff team would be more than happy to speak to you about your required food logistic services.